Caral was the main city in the ancient Norte Chico civilization. It is the oldest known complex civilization in all of the Americas, a perfect place to visit while you’re in Peru. The site is rich with thousands of years of history. Stand in the grounds and allow yourself to wonder about how this site, constructed at the same time as the great pyramids of Egypt, helped to shape the course of civilization forever. Discover what makes the people of Caral so wholly unique in Peru’s already brilliant history. Take the time to explore where it all began. Discovered in 1948 and a registered UNESCO world heritage center since 2009, carbon dating has placed textiles found at the site at roughly 5000 years old. This predates the previously considered oldest American civilization, the Mesoamerica Olmec, by almost 2 millennia. That’s the same amount of time between now and Jesus. It is thought that there were roughly 3000 people living in the Caral region, with up to 20,000 living in Norte Chico, which is now known as the Supe Valley. Archaeologists note that the people of Caral were the last of the Andean preceramic era. This means that as a society, they did not use ceramics. This is unusual, as ceramics have been used for many millennia in smaller societies. While there was no pottery, or artwork, found at the site, there were textiles. Textiles were used by the people of Caral in many different ways, but most notably, a quipu was found. Quipus are a method of account keeping, done by tying knots in string in a certain fashion. Quipus were used right up to the Inca Empire, and even into the Spanish rule. The quipu was not the only thing found that was used by the Inca. There were many temples, decorated with monoliths. Even an emblem, which was traditionally associated with the Inca, was discovered inside a temple. The Caral were peaceful people, no traces of war, weaponry or violent deaths were found. They were ruled by the religious leaders of the city. Religion was very important to the Caral, almost everything they did was associated to rituals and ceremonies. 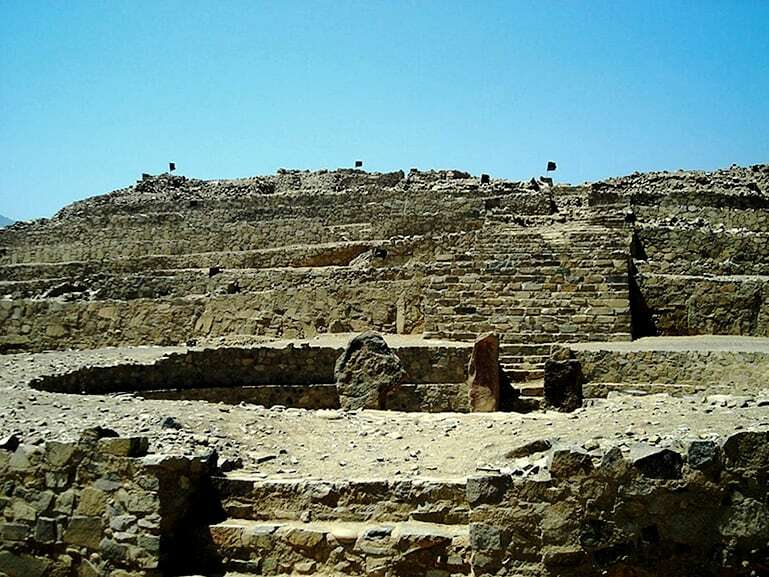 The people of Caral lived harmonious lives, trying to preserve the geographical environment and all of its resources, valuing the plentiful land they lived on, and the fresh water that flowed so close to the city. The shamans of each city acted as both religious figures, political leaders and experts in astronomy, medicine, and mediators between citizens and the gods, they were the only people in the society who had connections with the gods. It was through use of religion, hierarchy, and the power of the shamans that peace and order remained in Caral. It was believed to be necessary for the shamans to have constant contact with the gods in order to appease them. This meant that casts of the priests were made and left in the religious ‘thrones’ in the temples. Plagues or droughts were believed to be signs of a lack of dedication to the gods; tributes would be necessary to restore order. Caral’s temples take the form of pyramids. Used by the rulers as political, religious and economic symbols of power, ceremonies were performed that guaranteed the established social order. The pyramids have archaeological importance because of the technology and social organization required to build such structures. The entire region has an elaborate complex of temples, ordinary houses, and even an amphitheater. Peruvian archaeology initially believed that civilization descended from the mountains, toward the coast. Consequently, the discovery of Caral was very important, as it disproved this theory, and predated all other existing theories. Evidence of peaceful, well-organized trade with neighboring cities and those further inland has been found- bones excavated turned out to be from a monkey; meaning that there may even have been trade as far as the rainforest. 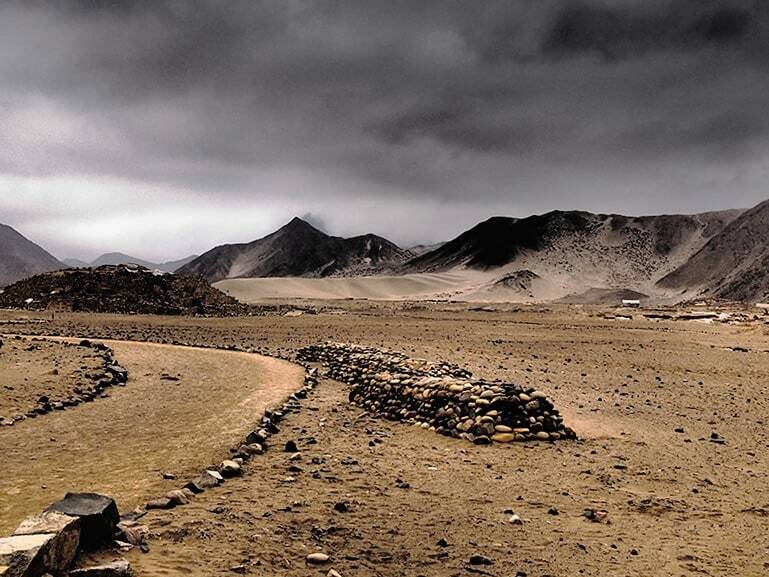 Roughly 200 kilometers from Lima, getting to Caral doesn’t have to be difficult. It’s a nice day trip out of the center of the city, and if you’re looking for more day trips from Lima, then there are plenty of options. If If you don’t want to spend loads of money on a tour then it’s relatively simple to get the bus. There is a program run by the ministry of culture that is designed to increase awareness and promote tourism to the site of Caral, the excursion doesn’t cost that much more than doing it alone and there are regularly extra stops, depending on the season. If this doesn’t sound like your thing, and you would rather do the journey by yourself then take note. To get from Miraflores to Caral your choice is limited to bus travel. There are a few different buses that go to Supe (the town closest to the ruins), you can check them out online, or just head to the station and buy them there. Tickets should cost S/. 15 each way. The bus stations are located in Plaza Norte, which you can get a street bus to from Kennedy Park in Miraflores. Just ask your accommodation for details. Or, you can take either a taxi or a collective taxi (a type of taxi that picks up different passengers going in the same direction). Once you are there and have purchased your ticket, the bus should take about 4 hours to get to Supe. Once you arrive in Supe, ask your driver the direction of the collective station. It should only be a street or two away. A collective taxi will cost you S/. 7 each way, or you can splash out and get a cabita (minivan) for around S/. 30 for both directions. Both of these options mean waiting until the vehicle is full before setting off. If you go on the weekend this shouldn’t be an issue, but through the week the people traffic may be slower, and therefore take longer. If this is the case, a collective will fill up faster. The tour will last around an hour to 80 minutes, and are only conducted in Spanish. If you don’t speak it, it’s advisable to come here with a translator, or an English speaking guide, otherwise it may be confusing. Once the tour is finished, walk back to where the collective left you. Again, on a weekend there will probably be one waiting, if not one will show up soon. This applies through the week as well, although the wait will probably be a bit longer. If you already have your return ticket there is a bus stop at the end of the road that it will pick you up from. If not then return to Supe bus station and catch your return journey from there. Caral is a pivotal archaeological site, which changed forever how we see and understand Peruvian history. It provides the building blocks of Peruvian culture, with influences reaching as far as the Inca Empire. This is an astounding feat and the historic importance of this is incredible. Allow yourself to be taken back in time and walk in the footsteps of those thousands of years before you, those in one of the first cities of humankind. Marvel at how this complex civilization influenced people for thousands of years, and maintained a society without war, without weapons, and without fear. Experience it. Experience Peru.